This whiskey gracefully meets the nose with a blast of rich oak and citrus, as nutty almonds give softness to the sharp bite of glazed cherries and brandy; lovely Christmas cake on the nose with icing to boot. 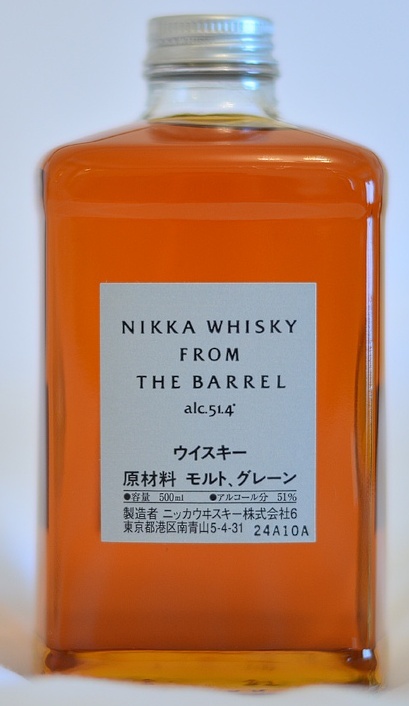 Bottled at 51.4%, the Nikka “by the barrel” packs a punch… or should I say, jumping spinning heel kick! This whisky is particular has grown on me, with its rich oily texture and bursts of sweetness all flooded with bitter-sweet cocoa and orange peel. With water that sometimes over the top sweetness mellows and softens, allowing bitterness and saltiness to shine through. The oak takes a lead role, as the sherry and sweetness are met with gushes of vanilla and cream. The finish, though, dies more quickly when water is added. Overall this is a great whisky, and excellent value! This entry was posted in Japanese whisky. Bookmark the permalink.